A-HOTEL.com - Luxury and cheap accommodation in Shanghai, China. Prices and hotel, apartment booking in Shanghai and surrounding. This indicative offer was derived from the most recently booked accommodation in Shanghai and sort by the price, from cheapest Shanghai accommodation to the most expensive hotels. 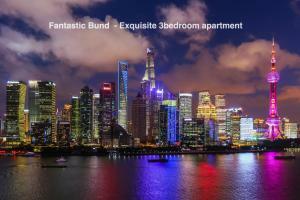 To select accommodation by your preferences we recommend to choose from 1 671 accommodation offers in Shanghai in total. By entering the dates of your overnight stay in Shanghai and using the filter tools you can sort the best possible accommodation for you. The entered dates of your stay are crucial for the most accurate offer as it derives all the online information on pricing and availability of Shanghai accommodation. Then you can book the selected Shanghai lodging (hotels, apartments etc.) immediately. Offering a shared lounge, Wonderoom Apartments (Xintiandi) provides accommodation in Shanghai. Complimentary WiFi is featured. Boasting a fitness centre, garden and views of city, SSAW Pagoda Hotel Shanghai is located in Shanghai, 7 km from Shanghai Jewish Refugees Museum. Featuring a 24-hour front desk, this property also provides guests with a restaurant. Featuring free WiFi, The Shanghai EDITION offers rooms in Shanghai, only a 5-minute walk from the Bund. The property is situated just about 1-minute walk from Pedestrian Street of East Nanjing Road and about 1. Set in Shanghai, 3.2 km from Jing'an Temple, CitiGO Hotel Shanghai Xujiahui offers express check-in and check-out and free WiFi. Set in the Changning district in Shanghai, only a 5-minute walk from Shanghai Hongqiao International Airport, Terminal 1, Mercure Shanghai Hongqiao Airport boasts air-conditioned rooms with free WiFi throughout the property. Guests can enjoy the on-site restaurant. Campanile Shanghai Jing An is set in the Jing'an district of Shanghai, a 5-minute walk from Jing'an Temple subway station (line 2 and 7). All rooms boast a flat-screen TV with cable channels and a private bathroom. Eric's home, boasting a garden, is set in Shanghai, 2.5 km from Shanghai New International Expo Centre and 8 km from Jin Mao Tower. Located in striking Jinmao Tower, an elegant Art Deco architecture, Grand Hyatt Shanghai is surrounded by Super Brand Mall and the famous Oriental Pearl TV Tower. The property boasts luxuriously decorated rooms with floor-to-ceiling windows, a range of versatile meeting rooms and gourmet cuisine across 9 stylish restaurants. Situated in Shanghai, 1.6 km from Pedestrian Street of East Nanjing Rd. As the gateway to Xintiandi, the lifestyle and entertainment hub of Shanghai, The Langham, Shanghai, Xintiandi is ideally located adjacent to the retail utopia of Huaihai Road, surrounded by various trendy clubs, glamorous international restaurants and designer boutiques. Boasting Chuan Spa, an indoor pool and gourmet cuisine across several stylish restaurants, this property is a 1-minute stroll from South Huangpi Road Subway Station (Line 1), which provides easy access to the top tourist attractions in Shanghai. A peaceful retreat in the bustling city, Fraser Residence Shanghai is one block from Middle Huaihai Road, Shanghai’s business and entertainment centre. Offering comfort and convenience in airy apartments fusing Art Déco and Oriental-inspired bamboo accent, this eco property features air filter, water filter and water softener. Situated in Shanghai, Wonderoom Apartments (The Bund) provides lake views and free WiFi, 1.5 km from Shanghai Jewish Refugees Museum and 3. Blending 1930’s Shanghai charm with luxuries of the modern world, The Yangtze Boutique Shanghai is located in Shanghai’s city centre, just 30 metres from People’s Square metro station (line 1, 2 and 8). Its excellent leisure facilities include a gym and a historic ballroom. With modern guestrooms spread over 2 separate wings, the luxurious Double Tree by Hilton Shanghai - Pudong is just 500 metres from Lancun Road Metro Station (Line 4 and 6). An indoor swimming pool and pampering massage can be enjoyed on-site. Set in Shanghai, Sunshine Garden offers accommodation with free WiFi and flat-screen TV. Each unit is fitted with air conditioning, private bathroom and a kitchen including a fridge and a stovetop. Hanting Express Shanghai Hongqiao Shu'niu Qi bao No.2 is situated in Shanghai, within 13 km of Longhua Temple and 14 km of Jing'an Temple. Set in Shanghai, within 1.5 km of Jing'an Temple, StarHouse · Aurora offers accommodation with free WiFi and air conditioning. Providing free WiFi and a garden, Urban Rosa Cafe&Inn is located in Shanghai, 8 km from Longhua Temple. Featuring a shared lounge, the property is located within 12 km of Tian Zi Fang. Located in the Pudong district in Shanghai, IKEA Style 3 Bed Apartment(Next to Century Park) offers an equipped accommodation with a terrace and free WiFi. The property features garden and city views. CJ Apartment-Huaihai Road 697 offers accommodation in Shanghai, 1.2 km from Tian Zi Fang and 1.